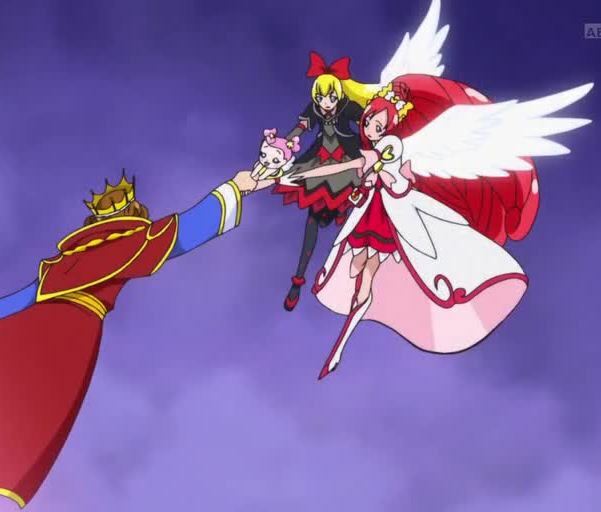 The finale to DokiDoki Precure just aired last Saturday. I was fortunate enough to have the experience of watching it while it was airing. I am a beginning student of Japanese, so I was not able to understand much while watching in Japanese except for what I could glean from the visuals. Still, it was quite exciting to watch while it was airing. It was particularly fun to see the Japanese commercials. Luckily, the English subtitles came out rather quickly this week, so I did not have long to wait before I learned how this story would end. There is a lot to discuss now that the series is complete, more than can be discussed in just one article. Here on Senshi, we have covered the ongoing series extensively, so it seems fit to explore some of the many topics of the series. 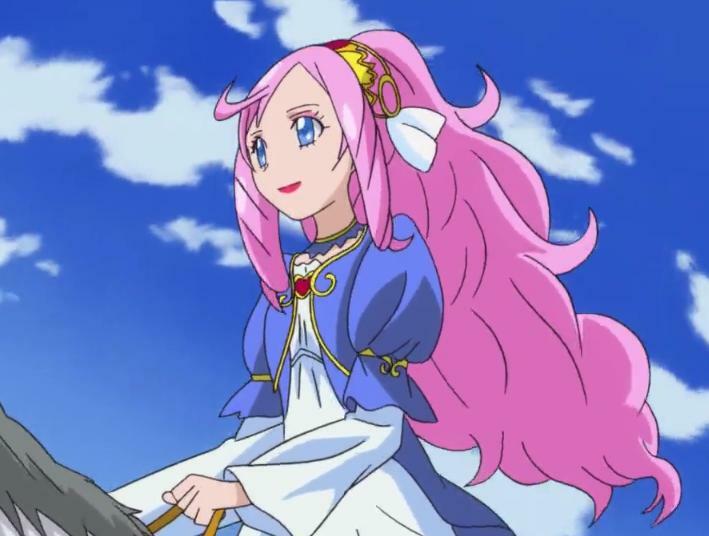 Princess Marie Ange, and her descendants, are central to the story that was told in Doki Doki Precure. Princesses in stories can represent Archetypal Maids, and I think that in this story, Princess Marie Ange represents humanity as a whole. In episode 46, we learn what happened to the Princess, and how she broke her heart in two as a result of the painful knowledge that her father had opened the door to Evil in order to save her life. I refer the reader back to Cure Tadashiku’s article, Doki Doki Precure 46: The Fundamental Questions of Existence. Half of the Princess’ heart became Regina-san, who fell by her father. As we recall, her father was possessed by Evil and became King Selfish. The other half of her heart fell in the arms of a traditional grandmother and became Aguri-chan/Cure Ace. The Princess’ empty shell became the baby, Ai-chan. In episode 46, we are told that Aguri-chan and Regina-san are the Light and Shadow sides of the Princess. Indeed the part of the Princess’ heart that had become Regina-san had become dark and corrupt. Yet, Regina-san was able to be purified. The topic of Light and Shadow Selves, or True and False Selves, is a recurring theme in Precure. In Heartcatch Precure, Cure Moonlight’s Shadow Self or False Self is represented by Dark Precure. Cure Moonlight also had a father who had been corrupted by Evil, and her father created Dark Precure specifically to be her enemy. 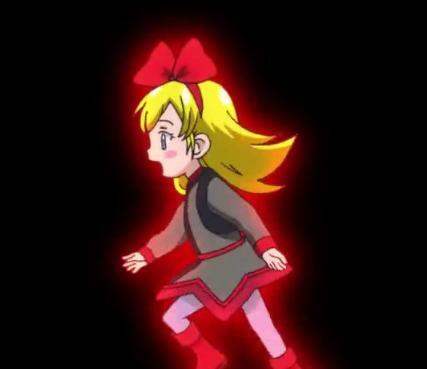 In Heartcatch Precure, to defeat Dark Precure, Cure Moonlight had to embrace her, and when she did, Dark Precure dissolved, and Cure Moonlight’s broken heartseed became whole. Why did this not happen the same way in Doki Doki Precure? I think that the reason for this is that Regina-san was not really the Princess’ False Self. When the Princess split her heart in two, she said that one half was the love she had for her father and the other half was the love to protect everyone’s smiles. She was under the mistaken belief that conflict between these halves was inevitable. Yet, before the King became corrupt, these two sides were united, and her whole heart was pure. On the opening page of the Daughters of Shining Harmony, there is a discussion of love, or Amity. The article can be found here. This article explains that there are two types of Amity, Menamity and Mayamity. Menamity, or Little Amity, is the love that binds all people together, or “the love to protect everyone’s smile.” Mayamity, or Great Amity, is deep personal love which may exist between family and close friends. In the West, there is sometimes the mistaken notion that these types of love are in conflict with one another, and that deep personal love excludes a more general love for others. 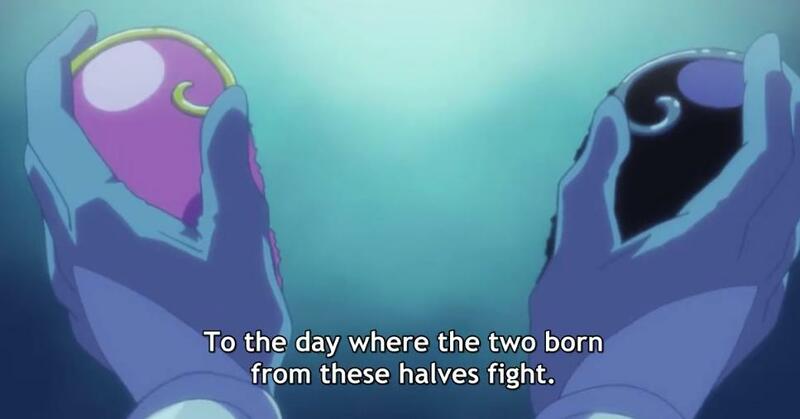 This is exactly the lie that Bel-san told the Princess, that her love for her father, and the love that he had for her, was selfish, and that it excluded the love for their people. The King believed that lie when he sacrificed the peace and well-being of his Kingdom to save his daughter, and then the Princess believed that lie, which caused half of her own heart to become corrupt as well. She could not choose between Mayamity and Menamity, so she split her heart in two, believing that these parts of her heart would have to fight each other. As the story progresses through the finale, we learn that the Princess was wrong. Her love for her father, embodied in Regina-san, and the love to protect everyone’s smiles, embodied in Aguri-chan, did not have to fight at all. Indeed, it was when they united that they were able to free their father from King Selfish, which also saved the world. In the end, Regina-san learns Menamity, and Aguri-chan learns Mayamity. Both halves of the Princess’ heart become whole again. Regina-san helps save the world, and Aguri-chan learns to make friends. The love for one’s family and the love to protect everyone’s smiles are indeed both love and they are in harmony with one another.